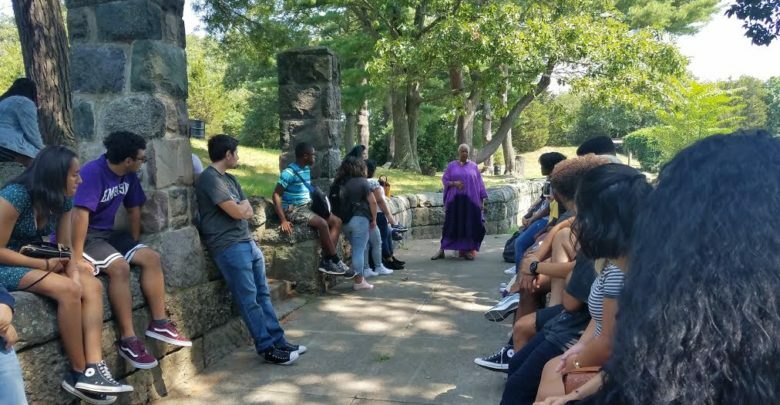 Students at the pre-orientation went to Franklin Park in Jamaica Plain on an intercultural tour of Boston. Photo courtesy of Christopher Henderson-West. The office of intercultural student affairs rolled out a new pre-orientation program this year for students of color, according to the department’s website. The college opened the free program to self-identifying students of color on a first-come, first-serve basis and held it from Aug. 25 to Aug. 27, the same days international students arrive on campus. The 50 students who attended the pre-orientation had the opportunity to mingle and bond with each other, tour parts of Boston through an intercultural lens, and have candid conversations with people of color already in the Emerson community, according to the program’s press release. According to Emerson’s admission profile, about 27 percent, or 243 students, of the incoming class of 2018 are considered students of color. This percentage does not include international students. Emerson’s pre-orientation is not the first of its kind. Schools like Wheaton College, Smith College, and Brown University previously adopted similar pre-orientation programs. “I was in a way really relieved and taken aback a bit. I was just very happy the school was making strides to include the students of color,” Rocio Perez, a freshman theatre and performing arts major who attended the orientation, said. Perez said she knew Emerson was inclusive of LGBTQ students, but in terms of students of color, she wasn’t so sure. Before arriving to Emerson, Perez said she had read senior and musical theatre BFA Cindy Tsai’s essay about microaggressions Tsai experienced in the program. As an incoming performing arts student, Perez said she felt hesitant about what to expect, but she felt even more determined to institute a change in the department. “When I came to the Accepted Students Day, it was just a majority–white student body that had been accepted. And then, also, the students who were presenting were majority–white,” she said. Junior Chris Henderson-West helped lead a pre-orientation activity called Project Intercultural Creation of New Ideas Confab, or Project I.C.O.N.I.C. Student groups invented and presented solutions on issues focused on the misrepresentation and lack of diversity in the media, he said. “There’s a community that is able to be fostered when [students of color] are all able to be together in the same room and new ideas can come out of their collaboration,” Henderson-West said. Freshman Alyssa Lara said she feels more welcomed by the Emerson community after attending the pre-orientation program. She said she was hesitant going to a college in Boston with a predominantly white population. Henderson-West said he and other returning students of color who spoke during the Candid Conversations segment of pre-orientation wish they had a similar program when they began their time at Emerson. Perez said when orientation week officially began, she was reminded again that she was attending a majority-white school, much like her former high school in Maine. Director of Intercultural Student Affairs Tamia Jordan, who planned and created the pre-orientation, was unavailable for comment.